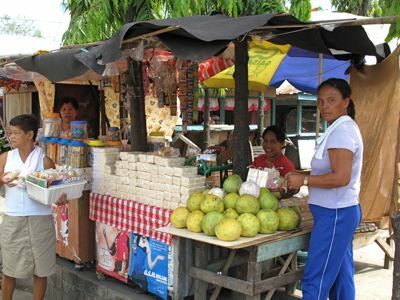 The pomelos or suha from the town of Carcar in Cebu have a reputation that precede them. Many folks in Cebu are certain “takuy” is seedless, succulent, sweet and wonderful, and it ONLY thrives in Carcar. I am a HUGE fan of pomelo so I have tried it in dozens of different places from Korea, China, HK, Vietnam, Cambodia, Thailand, Indonesia and dozens and dozens of sources in the Philippines from the Cagayan Valley to Bicol, the Visayas and Mindanao. So far, I have had takuy 3-4 times and in all cases, they DID NOT impress. A paler variety of pomelo, similar to the ones from China or Bangkok, the ones I have managed to taste are dry, tasteless and yes, somewhat seedless. I’m not sure what makes these unique to the area around Carcar, but for now, I think I will be sticking to the town’s other specialty, chicharon instead. Takuy or no takuy…I have given up on pomelos Bangkok, Thailand, etc. However, MM , if you see BLANCO de ORO grapefriut, grab it! The best ever !!!!! so sweet and lives up to its name! Davao pomelo is the best! Yup diday I agree!! Davao pomelo..the best. So sweet….BTW MM I found Alpine full cream evap and Milkmaid condensed at South supermarket.Doing my leche flan experiment in tandem with you. In my steamer right now,NOT leche flan but the HARDINERA of Quezon. I don’t know how it’ll come out but I somehow got a recipe from a local tv program featuring specialty dishes…I love that so decided to experiment. nenita’s davao pomelo, definitely for me! The best pomelos I have had for two years running come from Taiwan or Thailand (not clear to me which is which), available in some groceries and roadside stalls during the holiday season. This year it came under the brand “ABC pomelos” and our suki fruit vendor sourced it from Divisoria. It has very thin, supple skin that does not require major struggle to peel. Best of all, the segments are large, very juicy and sweet, white. When we gave these away as gifts, the recipients always asked us where we got them. davao pomelo has my vote, too! a friend who’s a local of davao gave me the tip na the thinner the peel and the uglier it looks, the sweeter and jucier it is. so far, when i buy davao pomelos using these criteria, they don’t fail me. by the way, have any of you heard or tasted “lado?” its another local citrus fruit na nawawala na sa sirkulasyon. its a cross between suha and dalanghita or kahel. had tried it many years ago as a gift from the north. Hey Chris…by any chance are you from Batanggas? …that “ladu” is what my mom calls it and she used to buy it by the “kaing” whenever we go to Batanngas every week-end….and they divide it among my siblings. That’s very true, bought some in Carcar when there last, but was so disappointed. I’d rather buy Davao pomelos. That’s very true, bought some in Carcar recently but was so disappointed. I’d rather buy Davao pomelos anytime! i agree about davao pomelos. 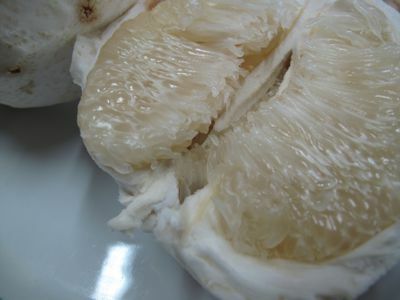 when i’m in iloilo around february, we buy pomelos from a certain MD’s orchard, and it is very GOOD!! they sell it just in front of their gate, from a makeshift stand–i’ll do ”research” on this—in fact i’ll probably have some tomorrow or today, since i’ll be there in a few hours–makes the 20-hr trip worth it!! fresh pomelos and mangosteen from Zamboanga are the best! the pomelos were quite small compared to the ones from Davao but definitely sweeter. when in season it costs roughly 25 pesos, a friend who was giving us the fruits told me it’s because majority of the fruits came from war stricken barrios, some in Jolo, the farmers sell it really cheap because there’s some sort of discrimination in buying produce from those place, that sometimes the traders claim the fruits came from Davao but in reality the fruits were grown in Zamboanga, Jolo, or even Basilan. My relatives are from Quezon, and they have this thing called “suha”. I am not sure if its the same as what most of you are talking about. But I remember this to be so so sweet and juicy. Its pretty big too, (a medium size soccer ball), but once you’ve peeled them, parang malaking sunkist orange lang siya. Pero talagang ang sarap. Here in Houston, I always buy the “pomelos” ok lang, but nothing compare to the “suha” that I am used to. BettyQ, it’s very true,,,,i’ve tasted the Blanco De Oro over new years and they were the best grapefruit i’ve ever tasted. I see a carnival of suha whenever Chinese New Year is approaching. The most memorable suha I had was the from Dizon Farms in Davao. ted: naman, naman, nagbibiro ka ba or tutuo yang sinabi mo? I agree with kit and ted, urine diluted with water triggers a continuous flowering of bougainvilleas, as well. Ebba…pee is nitrogen BUT it has to be DILUTED preferably before you can use it as nourishment for your plants or it can burn your plants if used in pure form….much like manure or compost tea….you have to dilute it with water. i have to agree that the famed takuy of carcar is no longer the juicy and sweet pomelo we used to eat. as a true blue carcaranon, we used to order sacks of takuy during the season and most especially during the november fiestas as give-aways to guests. from what i have heard and experienced, almost all the takuys were wiped out during the Super Typhoon Ruping (late 80’s) i was in high school then. the few trees that survived, never produced the same juicy pomelo up to now. very sad indeed. you are right marketman, we better stick to the chicharon. but hey, have you tasted our tortas made by the Bargayo family in Pob 2 ? or our famous pastilletos(some call it empanada)? if you havent, i sweetly urge you to try it. You are right MM. I have tried the takuy when I passed by Carcar and was very disappointed. Nothing compared to my Lola’s takuy in Barili when I was younger then. thanks sa inyo, hah, now I know.